Myra Hiatt Kraft, who surrendered much of her privacy as a daughter and a spouse in families led by powerful men, then turned that sacrifice into a philanthropic tool for public good, died in her Brookline home of cancer yesterday. She was 68. Reluctantly famous, Mrs. Kraft found a beneficent use for the recognition that came with being married to Robert Kraft, owner of the New England Patriots football team, as they took their place among Boston’s most influential and generous couples. Often she was. Never simply a boardroom benefactor, she staffed phone banks for fund-raising drives and made persuasive calls when a cause needed the financial boost only the rich can provide. The charities she helped included Jewish organizations worldwide, medical causes, and youth groups. With a hands-on approach, Mrs. Kraft helped redefine the philanthropist’s role. 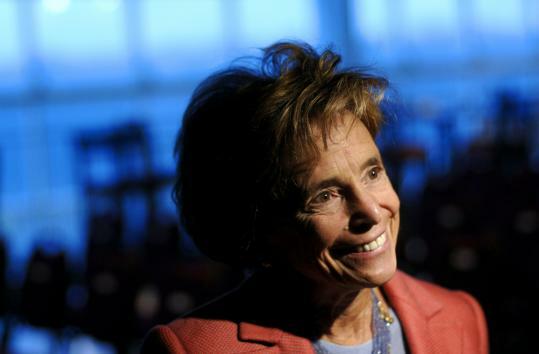 Prone to asking piercing questions, she chaired the boards of Combined Jewish Philanthropies of Greater Boston and the Boys & Girls Clubs of Boston, which so valued her vision and drive that it waived term limits to keep her at the helm from 1996 to 2002. Other boards on which she served included those for her alma mater, Brandeis University, and for The Boston Foundation, the United Way of Massachusetts Bay and Merrimack Valley, Brigham and Women’s Hospital, the American Repertory Theater, the American Jewish Joint Distribution Committee, and Facing History and Ourselves, a Holocaust education organization. So involved was Mrs. Kraft in philanthropy that perhaps her biggest worry when her husband bought the Patriots in 1994 was that the large sums of money spent and borrowed would curtail their giving. He assured her they wouldn’t, she told the Globe in 2007. Instead, their philanthropy increased along with the burgeoning financial resources of a successful franchise. As of March, Forbes magazine estimated the family’s net worth at $1.5 billion. Along with several simultaneous memberships on boards, Mrs. Kraft had managed the Robert and Myra Kraft Family Foundation and the New England Patriots Charitable Foundation. The former contributed to Jewish groups and to medical, educational, and arts organizations; the latter sent money to youth sports organizations, Catholic schools, and programs for at-risk children. Choosing recipients, she said, was simple. The numerous recognitions Mrs. Kraft received included a Camille O. Cosby World of Children Award, presented by the Judge Baker Children’s Center in Boston. At Dana-Farber Cancer Institute, the Krafts funded the Kraft Family Blood Donor Center, and the Kraft Family professorship in medicine at Harvard Medical School and Dana-Farber to support Dr. Kenneth Anderson’s research on multiple myeloma. The Krafts also funded a community oncology and health disparities outreach program and research on women’s cancers. “I hope the Kraft family can find comfort knowing that their support of Dana-Farber has benefited cancer patients worldwide and that it stands as a fitting testament to Myra and her commitment to help others,’’ said Dr. Edward J. Benz Jr., Dana-Farber’s president. Causes involving her Jewish heritage were among Mrs. Kraft’s priorities, and she traveled to Israel a few times a year. Mrs. Kraft inherited her passion for philanthropy early from her father, Jacob Hiatt, who escaped the Holocaust by emigrating from Lithuania in the mid-1930s. His parents, sisters, and brother perished in concentration camps. The wealthy owner of a packaging company, Hiatt was one of Worcester’s greatest patrons of education, the arts, and religious causes, and Mrs. Kraft emulated him in 1948 when she made her first foray into charitable work. She was 5 when her father visited European camps for those displaced by World War II, then traveled to Palestine, which was on the cusp of becoming Israel. While he was away, she wanted to help at home. By the time Mrs. Kraft was an adult, she measured contributions in the millions. Since marrying in 1963, the Krafts have given away more than $100 million to organizations involved in everything from changing lives in Israel to helping those hobbled by urban blight in Boston and Worcester. At Brandeis, she was a history major when she dined with friends one evening in 1962 at Ken’s delicatessen in Copley Square. Robert Kraft walked in with friends after a Columbia-Harvard basketball game. He drove to Brandeis to find her. At first, she declined a request for a date because she had plans with her boyfriend, but “we wound up going out, and she proposed that night,’’ he said. The family consolidated its holdings into the Kraft Group. Robert is the founder, chairman, and chief executive of the organization. The couple’s oldest son, Jonathan, of Brookline, is president and chief operating officer. The next oldest, Daniel, of Newton, is president-international. Josh, also of Newton, is president and chief executive of the Boys & Girls Clubs of Boston, and the youngest, David, of Boston, also works with the Kraft Group. Mrs. Kraft also leaves a sister, Janice Hiatt of Pembroke, and eight grandchildren. A memorial service will be held at 10 a.m. tomorrow in Temple Emanuel in Newton.